I recently discovered that I am in the 40% of the population that has a genetic variant that causes a reduced ability to convert folic acid into folate (folate is the usable form that the body needs for essential metabolic processes). In my specific case, I process 50% less folic acid into folate, and some others have it even worse, with a 70% reduction. Having these genetic changes is associated with a moderate increase in an infant having spina bifida (1). I was also shocked to learn that there is scientific evidence building that the synthetic form of folate, which is what we all refer to as 'folic acid', can stick around in the body and cause cancer if it remains un-metabolized (called ‘UMFAs’) (2). In my case, 50% of my folic acid intake remains unprocessed and may be doing harm to my body. Yikes! Most prenatal vitamins on the market contain the synthetic form ‘Folic acid' or ‘Vitamin B9’ that can cause a build up of these potentially harmful UMFAs. I highly recommend avoiding these supplements. Whether you have an MTHFR variant or not, I highly recommend choosing a supplement that contains folate directly from whole foods which unlike its synthetic versions, is never harmful. Another option which is particularly good if you have a MTFHR variant is to find a supplement that contains the bioavailable ‘final’ form of folate, called 5-MTHF or methylfolate, which bypasses the conversion step altogether and thus does not leave behind any un-metabolized folic acid. Both options are a much safer option than taking synthetic folic acid and have all the same benefits, such as reducing the risk of neural tube defects. Garden of Life mykind Organics Prenatal once daily is the best choice for a whole food multivitamin with natural folate. This multivitamin is entirely organic, vegan, gluten free, non-GMO verified, and does not contain any synthetic binders or fillers. The Garden of Life makers have also included organic ginger and lemon peel to help fight the nausea commonly occurring in pregnancy. One tablet per day offers 600 mcg of natural folate which is 100% of what you need per day if you are pregnant. If you have a MTHFR variant, you will have a reduced ability to absorb all 600 mcg in which case I suggest that you use the Wholesome app to ensure you are also getting folate from your diet. Cost: For $69.82 you get a 3 month supply (That's $23.27 for a 1 month supply) Note: prices may vary on Amazon. They also sell this in gummy form!﻿﻿ Its 600mcg folate in a serving size of 4 gummies. This is a gummy multivitamin containing 800 mcg L-methylfolate. The serving size is 6 gummies per day. A huge bonus is that it contains DHA from fish oil but it’s not too fishy tasting. It is non-GMO, gluten free, and allergen-free containing no synthetic color or preservatives. It does not contain any iron. Thorne Research offers a a complete nutritional supplement for pregnant and lactating women. It is a vegetarian pill but not vegan. It comes with 90 tablets and you must take 3 tablets per day to get 1,000 mcg folate in the form of L-5-Methyltetrahydrofolate. This form is well-absorbed by the body and is not affected by variants in the MTHFR gene. Thorne specializes in reducing the risk of stomach upset by offering nutrients such as iron and folate in the form that is tissue-ready and more easily digestible. It includes 45mg of iron which is higher than the recommended amount of 27mg per day for pregnant women. If you struggle with anemia, and you have low folate levels, or are affected by a MTHFR variant, this is a great option for you. Zahler offers an easy to swallow softgel prenatal multivitamin. It contains 1,000 mcg folate in the ideal activated form for absorption. It also contains DHA which is a plus. The serving size is 2 tablets per day and 60 tablets are provided. It has 27mg of the bioavailable form of iron which is 100% of your daily requirement for pregnancy. It also the only option that contains Lutein Zexanthin for vision health. There are no herbal additives and no artificial color or preservatives. It is not vegetarian/vegan but it is certified kosher. This is a great option for those that aren't yet taking DHA and are low on folate or have a MTFHR variant. Cost: $32.47 for 1 month supply tablets. 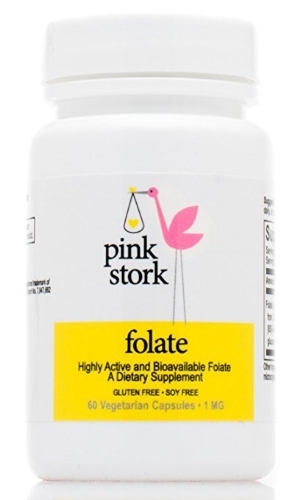 Pink stork offers folate on it's own. That means it isn't a multivitamin, its simply 1,000 mcg of folate in the bioavailable form for easy absorption. It is the same folate substance that's in Thorne and Zahler's products. All three of these companies source their folate from the company Quatrefolic. You only have to take 1 tablet and it is all vegetarian free from all the common allergens: free from milk, gluten, eggs, fish, shellfish, tree nuts, peanuts, wheat, soy, GMOs, and preservatives. This is a good option for those that already have a multivitamin and that only wish to get added folate. Which folate supplement is better for you? Personally, I use the organic food blend option Garden of Life - myKind Organics because I would rather ingest organic whole foods whenever possible and then I also use the Wholesome app to get more folate from my food. If you have a genetic variant on your MTFHR gene, you will have a reduced ability to convert all of the folate from food (or a food based supplement like Garden of Life). To mitigate this, I recommend that you also get lots of folate from your diet. There is no need to worry about getting too much folate, its not dangerous in excess like it is with folic acid. You can read how to go about discovering if you have a MTHFR variant here. Another thing you can do is to take a supplement that has folate in the methylfolate form '5-MTHF'. 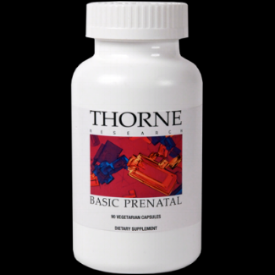 I recommend: Thorne Basic Prenatal, Zahler Prenatal DHA, or Pink Stork Folate. They all have the benefit that they use 5-MTHF that bypasses the MTHFR enzyme such that folate is already converted to it's 'final' state. These three companies all source their folate as 'Quatrefolic' from the company GNOSIS S.P.A, so they are all basically the same. By taking Quatrefolic, there won't be any wasted folate should you have a MTHFR variant. While I recommend taking a folate supplement if you are trying to conceive or pregnant, it should be in combination with a plant based diet high in folate from whole foods. I designed the Wholesome app to help me monitor and track toward my daily goals of nutrients, like folate. This is especially useful while pregnant when your nutritional needs increase. If you're pregnant, simply tell Wholesome what trimester you are in and it will help you track toward your specific goals. Wholesome sets your daily goals to what the National Institute of health recommends for your age, gender, and pregnancy stage, so you can rest assured that you will get what you need from your diet. If you want to adjust your goals further, you can customize them in the app. Besides folate, the app tracks 90 nutrients in your diet, including omega 3's like DHA, protein, lutein, and a variety vitamins and antioxidants. It also allows you to save your recipes for easy tracking. I hope it's helpful for you! Jessica Glago is the CoFounder of the Wholesome App. After having two different cancers in her childhood she developed the app with the help of her husband to get more healthfulness out of her diet. To date, Wholesome for iOS has had over 350,000 downloads and over 1.5 million whole foods tracked. The app has been featured on BuzzFeed, LikeHacker, CultofMac, and The Seattle Times.